This is an odd-ball piece of fiction, a comedy-drama. It is the way I write (and sometimes converse), no holds barred. The Penny Lane series is one medium at least through which I will expand my literary expression. Each of the stories will be set in a different part of Europe with the Penny Lane Agency the link. 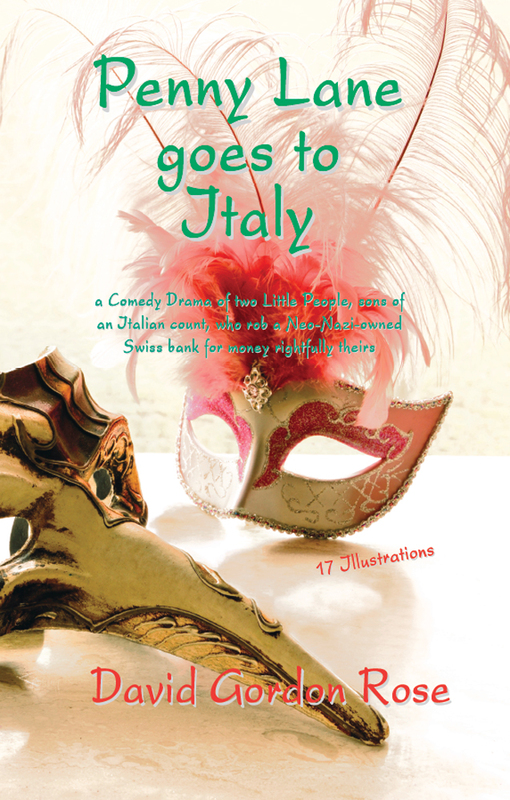 This first, in Italy and Switzerland and briefly in Liverpool is about an Italian count whose family is owed a substantial amount of money by a Swiss bank. It was loaned to the bank during WWII and enabled the Nazis to gain a foothold in the Swiss banking system (this is loosely based on fact). The Italian Count Vespucci doesn't know the bank is now in neo-Nazi hands and stalling over the matter of repayment. He calls on the services of the Penny Lane Agency (he and Miss Lane were fencing partners in their student days at Oxford University) for its expertise in such matters. The company saves the Italian family's reputation and finances and bows out of the story. Similarly, in the next in the series Penny Lane goes to Denmark set in Denmark and Sweden, Penny's sister-in-law is Danish and turns to him for help of the utmost discretion in a family crisis that began during the Spanish Civil War. The idea for the Italian burlesque of two Little People (ie. with dwarfism) robbing a Swiss bank comes about from many conversations with my flute and alto-player friend from our days with the National Youth Jazz Orchestra in the late 1960s. Two seventeen-year olds, Mike and myself were walking about in Narbonne in the South of France in the early hours after a concert the Jazz Orchestra had given in the town. We chatted until dawn about "girls ... and things ... and girls," Mike recently remembered. It was a heartfelt moment at the time when he said it was hard enough coping with girls as a teenager without being ... he indicated his own four-foot-something height ... a Little Person. Ten years on and still thinking about how I could even begin the story I was at a steam traction engine rally in the North of England. In a flash I saw a Swiss fairground scene with the Vespucci twins after the robbery making their escape from neo-Nazis on a magnificent Fowler & Co. Supreme Showman's Engine of 1930 vintage, the biggest at the rally. This was the first scene I wrote (7/2). It had to be set in St. Moritz and a wealthy Vespucci cousin, the Countess Anna, just had to live in the town and write herself into the plot. I dedicated the book to Mike Townend. He was deeply touched. Sadly he died in 2018. There is more information about the book on my publishing site here and the first chapter here. You can buy the paperback and e-book on Amazon. Below is some sample text that hints at the fun I had writing this book. Clementino's apartment was completely different from his brother's. He had decorated the panels in the bedroom with cherubs mimicking those in other parts of the house, though his were wearing little headphones from the pocket tape-recorders that were once all the rage. He wanted a Borgia's bed for his sixteenth birthday in the hope that an understanding girlfriend would help him explore its possibilities. He settled for a circular one to match the bedroom windows through which there was always something going on, from the maid practicing with her lipstick below left, to spectacular thunderstorms over the Valte on the upper far right. His main business and leisure pursuit was drawing and painting and his studio took up the rest of the apartment. A whole section of the gable roof of the north-west wing of the villa had been replaced with double-glazing and fitted with electronic blinds facilitating near-perfect lighting for painting. The studio was light, airy and Spartan. The roof timbers were visible and the supporting walls almost bare. And so too, one afternoon in mid-July after Wilson's last briefing, was Sophie. Clementino had placed his dearest friend on an alabaster pedestal in the skimpiest toga he could find. She was holding a Greek urn strung up to the ceiling but her arms ached nevertheless and she made it known frequently he was taking longer than usual on his first sketches. Also irritating Clementino was the small electric fire casting a red glow on this maiden's otherwise proverbial milk-white thighs. He changed it for a warm air fan. This wafted her toga and really was a distraction but he decided he could put up with it. He really wanted her in his bath for a Leida and the Swan picture but was unable to bring himself to ask because of how she would have to pose. He was exploring Classical themes because that type of illustration, with cheekier cherubs and lustier maidens, would soon be returning to the Pucci product range. The most chary aspect of his drawing session that afternoon was Sophie's two fellow actors parodying adoring fans. While he was trying to paint, they were ad libbing a play. The eldest, a lady of about thirty with cropped hair, red lips and fishnet stockings could have come off a Bertolt Brecht set. She could not take her eyes off Sophie. The youngest wasn't taking the theatrics too seriously. She had ingested something that made her giggle inanely and eventually pass out. His ill-considered comment he was but a humble artist was met with a broadside of the achievements of other 'humble' artists. Why, he was asked, was he not painting them with the virility of Klimt, Schiele or Picasso? Cut down to size, so to speak, he thought of retaliating and naming the ladies after the three Sirens. Already out of his depth he knew his fate would be one of drowning in a sea of insults. For the next hour down in the bilge, tiredness and hunger were forgotten as Clementino and Ignatio continued lifting levers and pulling out the contents of the bank vault boxes. On the whole there was remarkably little in the way of treasure. Sometimes there was a chortle or low whistle and the floor would look like a corner of Aladdin's Cave. It was usually because of cartamoneta, wads of it like it was going out of fashion. There were also pearls, bags of diamonds and other coloured stones cut and grezzo, gold nuggets, gold dust which they had never seen and smaller items such as watches, paintings, ivory, pottery, stamps and coins. Clementino had a careful look at an exquisite set of Indian miniatures marked 'from the court of the last Mogul Emperor, Bahadur Shah II, 1857.' In the same cubby-hole were several pieces of jade in a bag marked 'Boxer Uprising, 1901.' He knew these could be more valuable than the equivalent weight in diamonds. Most common were papers, locked tin deed boxes and jewellery, all of which they ignored. Their brief was to collect anything that could be construed as a bargaining tool, in particular items relating to the Fuhrer's person. Everything else would be forgotten, almost. The set of pornographic pictures Ignatio waved under his brother's nose was in the almost category. One of the snaps showed the very elegant naked lady wearing a rather splendid crown and gripping a large golden ball between her thighs, ecstatic in queenship he guessed. It took them an hour to reach the five bigger vaults at ground level at the far end of the wall they had started from. "Housey-housey!" Clementino exclaimed more convincingly than his brother, lifting a pile of documents onto the concrete. "Just these five vaults and the tin boxes in them if we can open them. Put all the other stuff back carefully. It's obvious in hindsight they would keep the bigger boxes for themselves." "All of it? Folding stuff, gold watches, black pearls? There's a diamond here as big as my ..."
Clementino took a deep breath but didn't need to speak. Ignatio thought of secretly swallowing four little beauties from a velvet drawstring bag bulging with sparklers. Surely the owner would not miss them? Two could be made into earrings for his girl and two would make matching cufflinks. Maybe two more could ... He got no further on his dare on realising he would have to come clean with Gabrielle with where they had come from. Unable to stop giggling over this and the possibility of them disappearing down the toilet led to him being swiped and the bag put back sulkily from where it came.